Bilingual Early Grade Reading in Mozambique - Planet Aid, Inc.
Food for Knowledge (FFK) is Planet Aid’s comprehensive nutrition and education project funded by the USDA under the McGovern-Dole International Food for Education and Child Nutrition Program. This multiyear project is providing children in rural areas of Mozambique with a daily fortified lunch, while also constructing needed supporting infrastructure (such as wells, kitchens, and storerooms), training teachers, and much more. FFK has been feeding children and building local capacity since 2011. In 2017, a new bilingual early grade reading initiative (called the literacy component) was added to the project to help improve literacy. Olivia Machele, FFK’s Literacy Component Coordinator, recently stopped by Planet Aid’s Elkridge, Maryland location to talk with Planet Aid staff about how FFK’s new literacy component was coming along. Ms. Machele was en route to the 2018 Comparative and International Education Society (CIES) Conference in Mexico City, where she helped present findings from the FFK project. Here’s a brief summary of what she shared with HQ office staff. In the development of the literacy component, Ms. Machele and her team worked closely with the Mozambican Ministry of Education and Human Development and Cambridge Education to produce exciting reading and instructional materials that are conducive to bilingual learning. The component is currently teaching students in grades one and two, and next year, grade three will be added. Approximately 11,000 students in the Maputo Province are being taught to read in bilingual classrooms supported by FFK, and that number is expected to grow as the program continues. 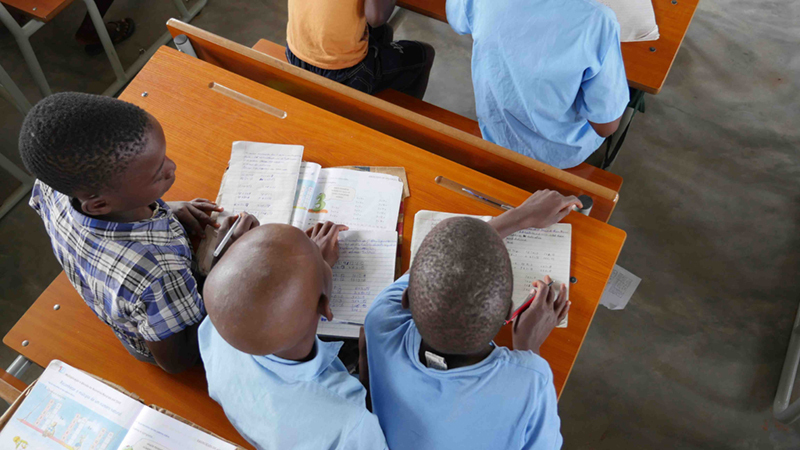 This approach aligns with Mozambique’s existing reading content and curriculum, working within the Ministry’s educational goals. “We work very close with the Ministry to support the expansion of bilingual education so that things can continue to work after the FFK program has finished,” Ms. Machele said. This partnership, she added, makes the literacy component and bilingual classrooms more sustainable for the future. The Ministry has recognized the effectiveness and quality of the new teaching materials developed under the FFK program. For example, the Ministry is reprinting the grade two materials for use beyond the project’s target area. In addition, the literacy material templates developed by FFK are being used to create new materials in other local languages across Mozambique. Although the national language in Mozambique is Portuguese—a remnant from the European colonial era—children in rural areas grow up speaking indigenous languages commonly used at home. However, this creates a learning obstacle in the classroom, where instruction is provided in Portuguese. “When students from the rural areas go to schools, they will find it difficult to communicate with the teachers,” Ms. Machele said. With the FFK literacy component, children learn to read and write in the language that they know, namely the languages of Changana or Rhonga, which dominate in the Maputo Province where the literacy component is being implemented. Gradually, Portuguese is introduced after children have phonetically “cracked the code” of the written word in their local language. When students are taught in this way, they are able to understand what the teacher is saying while gradually mastering the national language. By grade four, the students will be fully prepared to continue their education in Portuguese. FFK’s literacy component is giving structure to education in local languages and ensuring that students don’t end up with a knowledge gap. “There is no doubt that the students are learning to read and write in both languages [their local language, and Portuguese],” Ms. Machele said. A full EGRA assessment will be administered this year. Ms. Machele is from Maputo province, Mozambique, and grew up speaking Changana and Rhonga. She started her tenure with ADPP as a student at One World University, after which she began training student teachers at ADPP’s Teacher Training Colleges. She has held positions as an instructor, provincial coordinator, and vice headmaster; and also has experience working directly with primary school students. 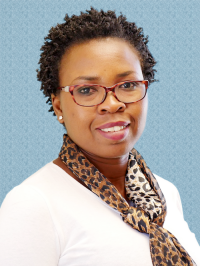 As the Literacy Component Coordinator for FFK, Ms. Machele oversees a staff of 35 and works closely with Cambridge Education and the Mozambican Ministry of Education and Human Development.